No classes for two consecutive days and I feel like a student again because I’m also happy. Class suspension means I have more time to do my chores and blog hopping but my son wasn’t happy because he loves to go to school even on weekend. Every morning when I say “it’s time to take a bath”, my son will shout “yehey! School time!” well, I do hope that he will be like this till college time. Anyway, while doing my chores, I saw our waffle maker and I know that it’s been years since the last time I made a waffle so I cleaned the waffle maker and checked the internet for easy waffle recipe. 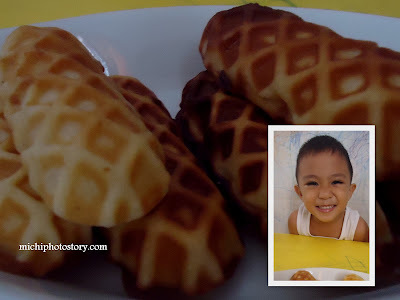 We made this for our merienda, I ate 2 pieces and my son ate 4 pieces. Next time I will add cheese or sausage. hay naku, nakakagigil nga talaga tong baby mo.. pakurot nga ethan! Uy, sarap nmn niyan :) nakakatakam. Hehehe.